Yesterday I showed you how to sew all the embellishments and quilt the Fidget Quilt using the open toe and walking foot on the Brother NQ900. Extra embellishments can be added now – the yo-yo flower, a coiled cotton braid and some buttons on a cord! 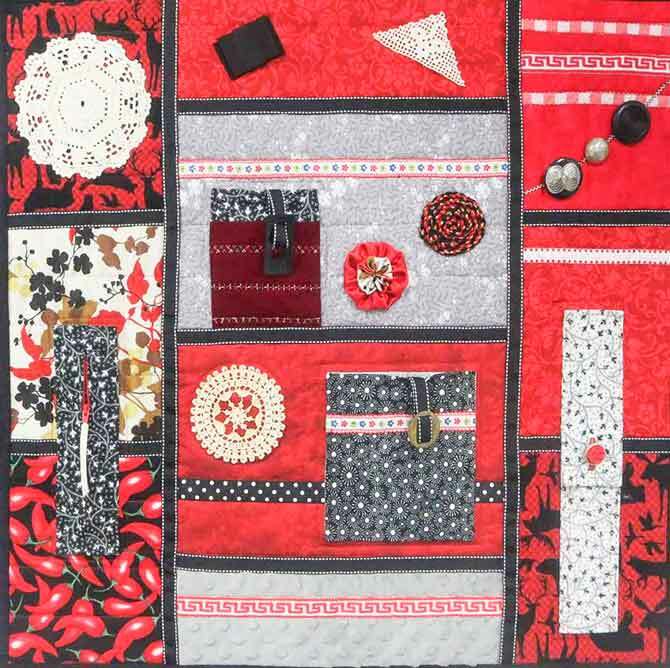 Everything needs to be attached very securely, as these Fidget Quilts are well-used and washed often. Now it’s time for the binding. I used flannel fabric for the binding and cut the strips 3″ wide. This will give me a ½” finished binding. You can see my detailed instructions for sewing on binding on my August 11, 2016 post on QUILTsocial . The binding was sewn using the walking foot and a scant ½” seam to allow for the extra thickness of the flannel fabric. Again, it’s a good idea to do a test run first on some scraps to get the right seam allowance for your fabric. You want to make sure the binding folds neatly to the back. I finished the binding by hand on the back, but it’s perfectly acceptable to sew it down by machine on this type of quilt. And here’s my finished Fidget quilt! It will be donated to a local nursing home and I hope someone will get some enjoyment from it. After using the Brother NQ900 machine for the past 2 weeks, trying many of the attachments and pushing lots of buttons, what do I think? I love this machine! It’s very user-friendly, the well-illustrated manuals are easy to understand and everything worked just as it was supposed to. What did I like best? Here are just a few of my favorites: the knee lifter, the wide table, the wide work space on the bed of the machine, the reinforcement stitch to use at the beginning and end of seams, the automatic thread cutter and the automatic needle threader. 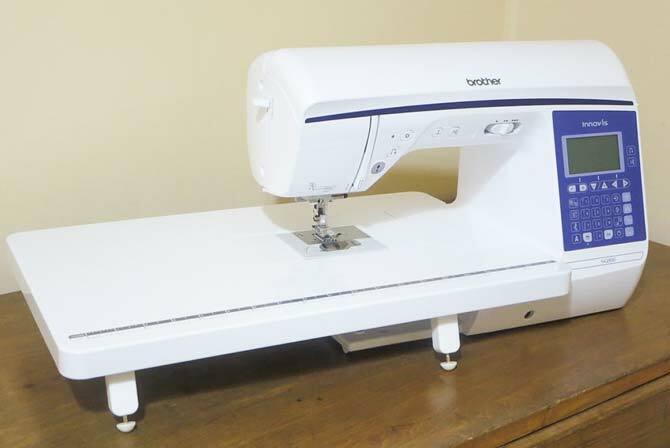 Click here to see more of the features of this great machine on the Brother website. I still have a few more techniques to try and buttons to push, so be sure to check back here on the QUILTsocial blog starting February 27, 2017 to see my next project using the Brother NQ900 machine! Wow! This is so nice! I love it!!!! I would love to have one of these. It sounds amazing.